This topic contains 3 replies, has 3 voices, and was last updated by legiocustodes 3 weeks ago. 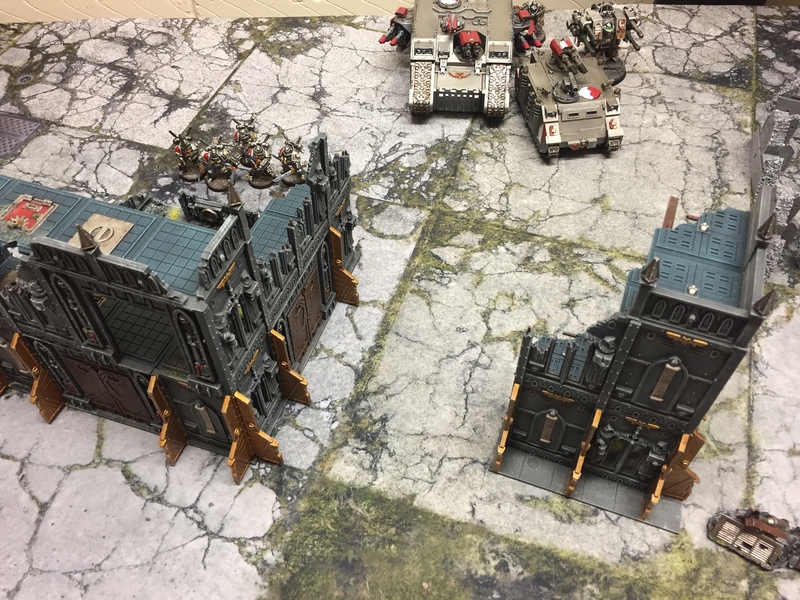 We decided to go for a game size of 1,850 points as this allowed my opponent to field his entire force of Grey Knights. 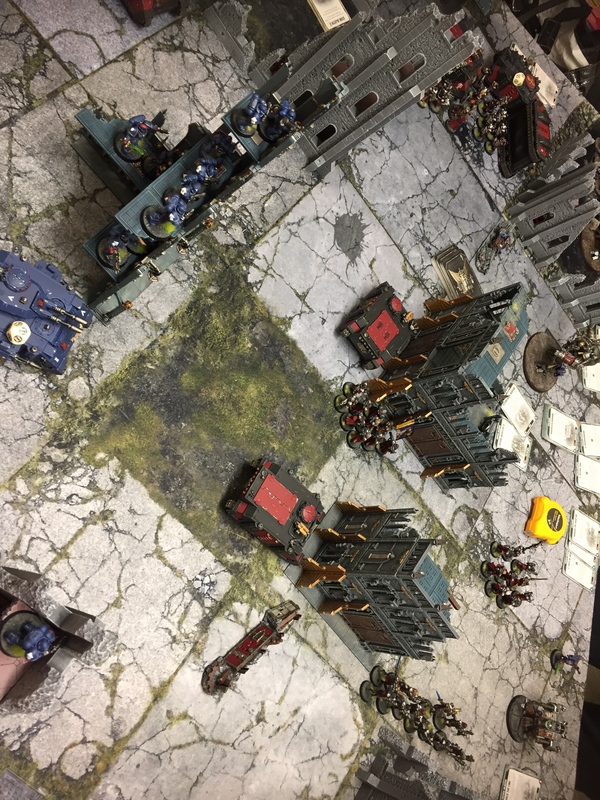 Unfortunately my Sororitas Force isn’t quite that big (yet) and so my noble Battle Sisters were accompanied into the fray by the Adeptus Astartes of the Crimson Fists. My Crimson Fists Force was led by Chapter Master Pedro Kantor who was supported by two Marine Lieutenants, a Champion and an Apothecary. The Battle Sisters were commanded by a pair of Canonesses from the Order of Our Martyred lady. The bulk of the force was an assortment of infantry squads, ably supported by a number of battle tanks and a flyer in the form of a Storm Raven gunship. 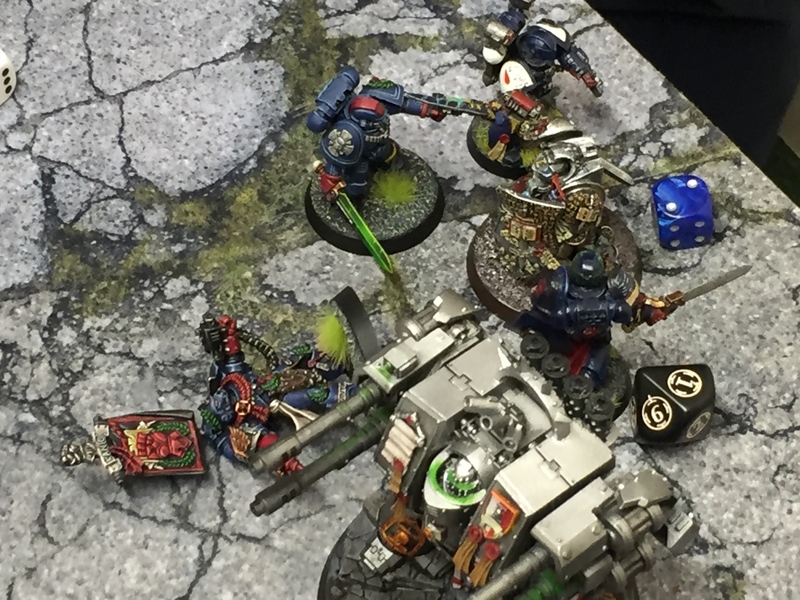 The Grey Knights were led by the combat monster that is Supreme Grand Master Kaldor Draigo, Grand Master Voldus and a third Grand Master mounted in a Nemesis Dreadknight. The force had an assortment of heavy infantry again supported by some heavy war machines! 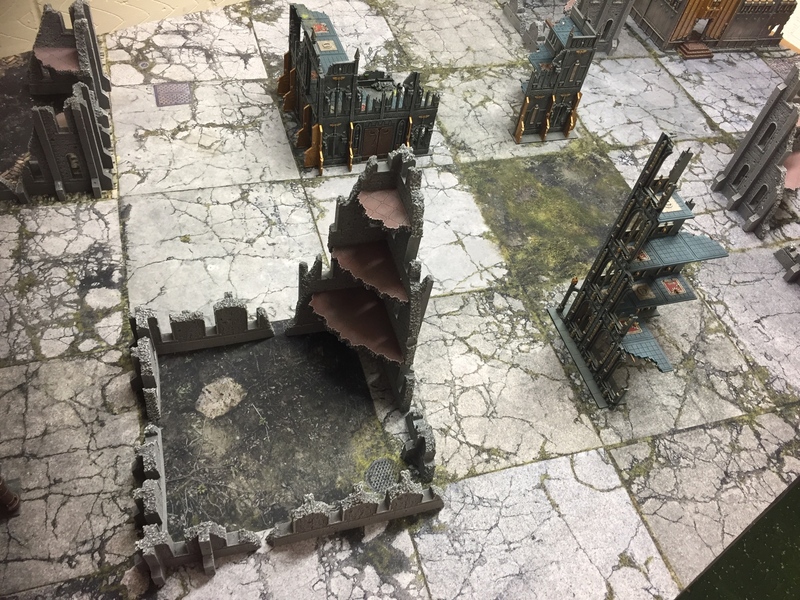 We went for a game based around randomly generated tactical objectives as these give the best experience in my opinion. This is because the tactical needs of each player change from turn to turn and prevents the game descending into two static forces just forming firing lines and shooting at each other for six turns. 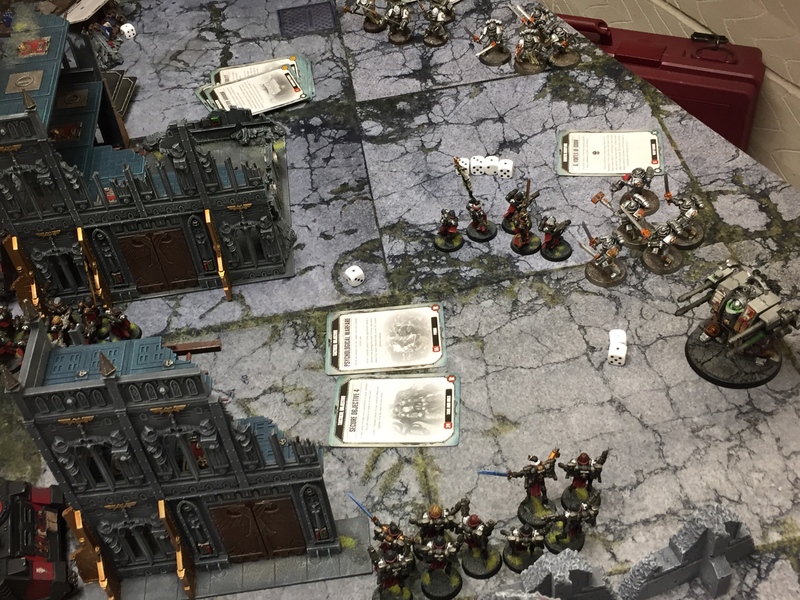 Under the new Beta Codex from Chapter Approved 2018 the Sisters of Battle are now brutal at close ranged firefights (especially their Storm Bolters thanks to a Strategem that makes them essentially mini-plasma guns). 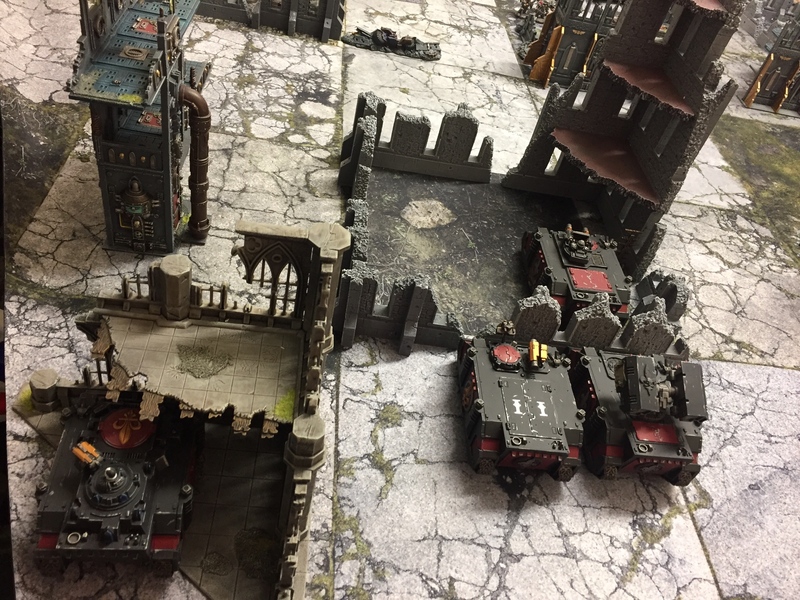 As such right from the start of turn one I pushed my Sororitas forwards in their Rhinos in order to dominate both the left flank and centre. 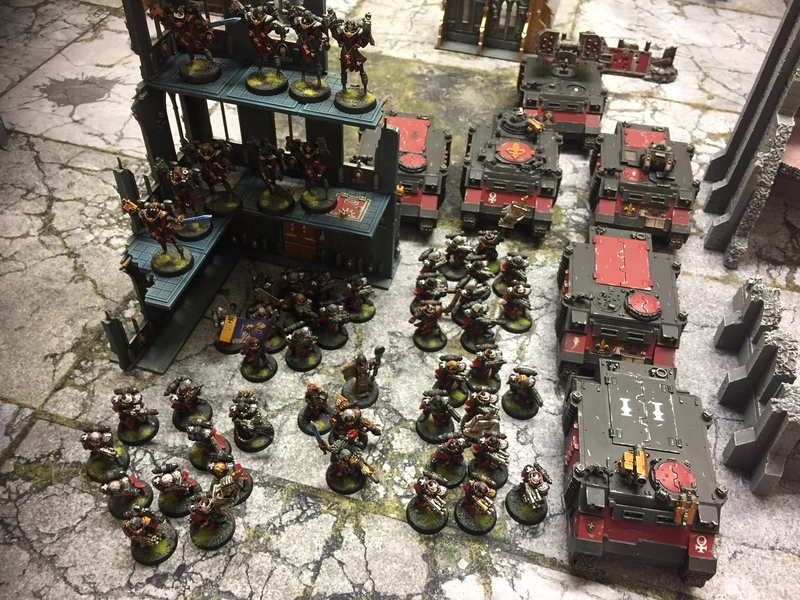 Meanwhile (unusually) the majority of my Space Marines actually remained fixed in their deployment area so that they could provide a hail of covering fire to support the Sisters. 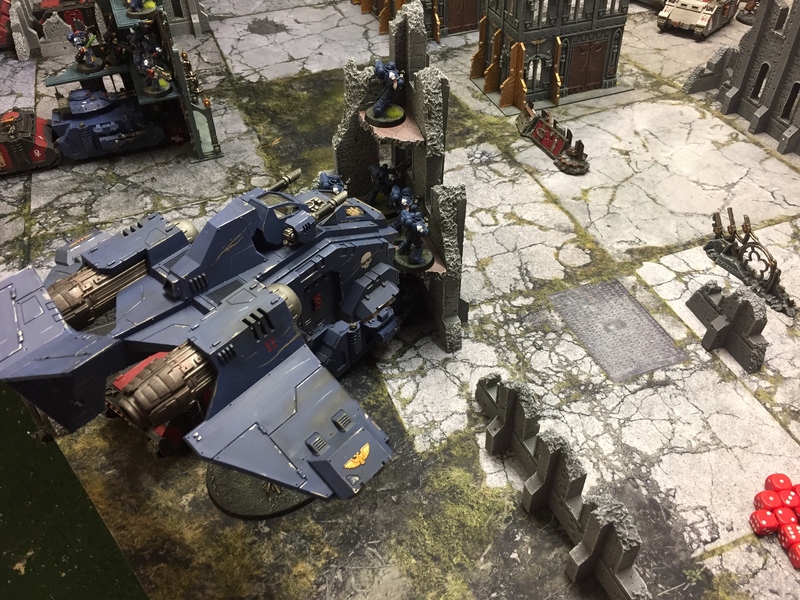 I think this threw the Grey Knights player slightly… who as a highly elite, mobile strike force are themselves used to seizing the initiative and taking control of the centre ground early on. 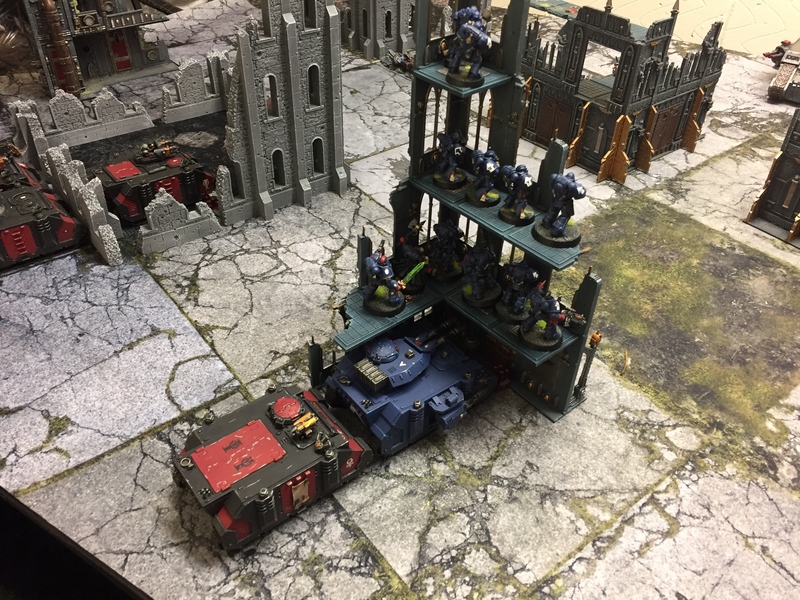 I used the Storm Raven both as a mobile fire base and also as a rapid delivery system for almost all of my Space Marine Commanders into the Grey Knights deployment area. …Which left them in charging distance of Kaldor Draigo for the next turn. 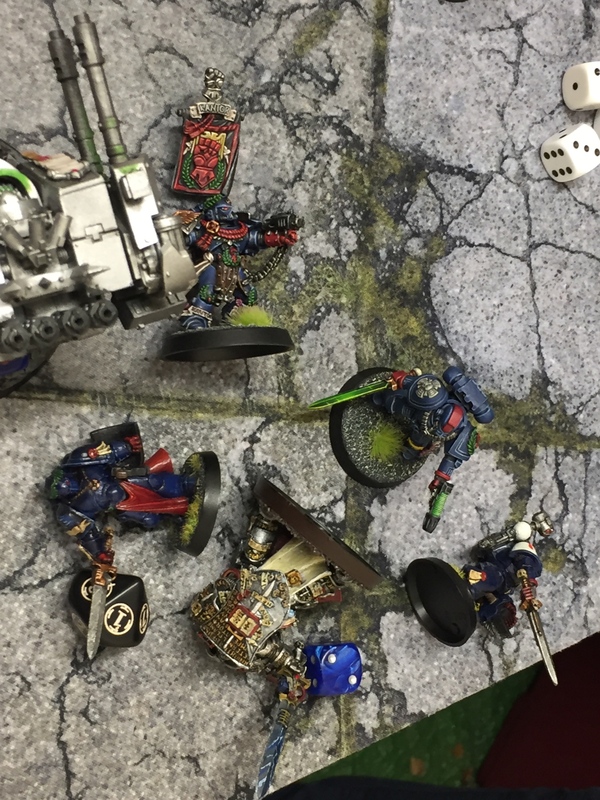 As such the only person to walk away from this carnage was a badly wounded Crimson Fists Lieutenant. 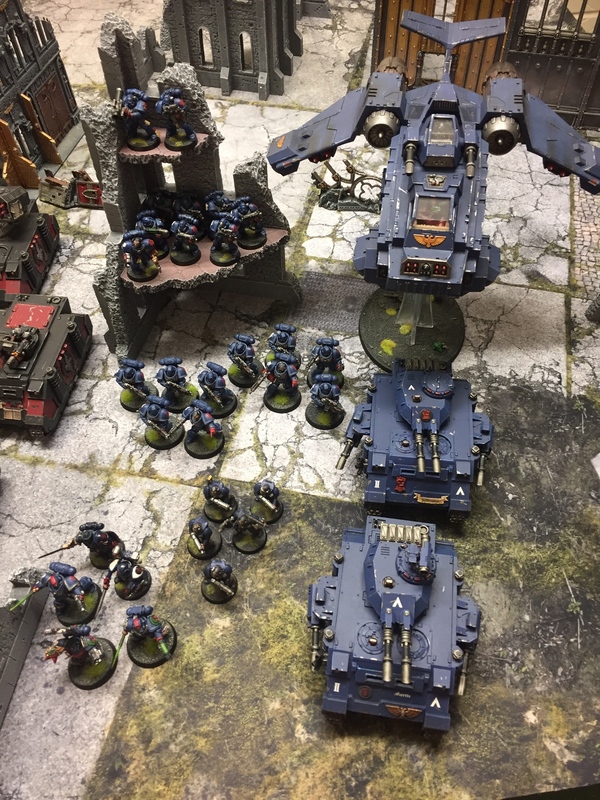 Whilst the Space Marine Characters were busy beating each other into submission the Battle Sisters and Grey Knights Infantry were involved in a series of short-ranged firefights and melees as they tried to wrestle control of objectives from each other on the left flank. 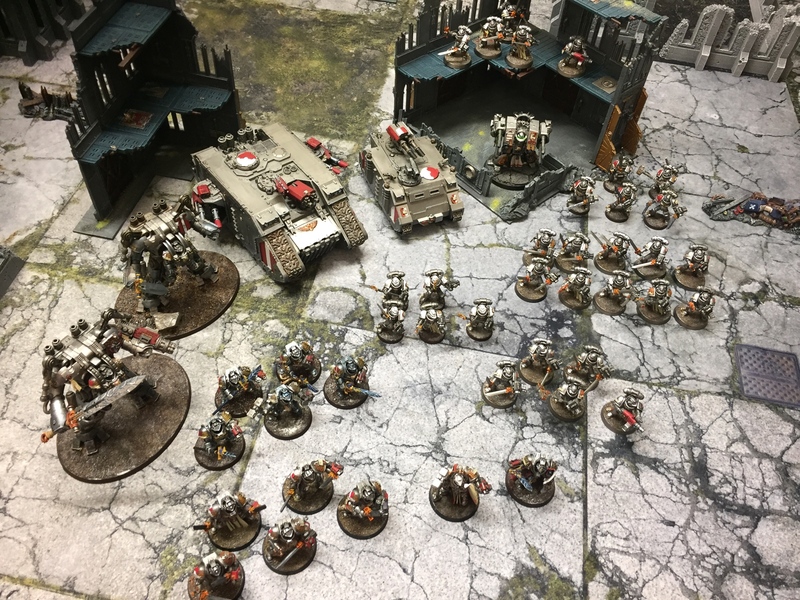 After a number of vicious rounds and some nail-biting twists it was the Sororitas (and their many, many meltaguns) that emerged victorious in this massed assault. And so after six intense turns the game finally came to an end; all there was left to do was count up the tally of victory points…. So it was a strong victory to the Crimson Fists and Battle Sisters. Hooray!! Overall this was a fantastic game and it was great to get my sisters back on the tabletop. Although the results show a decisive victory, the outcome of this game was actually a lot closer than it seems and right up until turn four I thought I was going to lose. 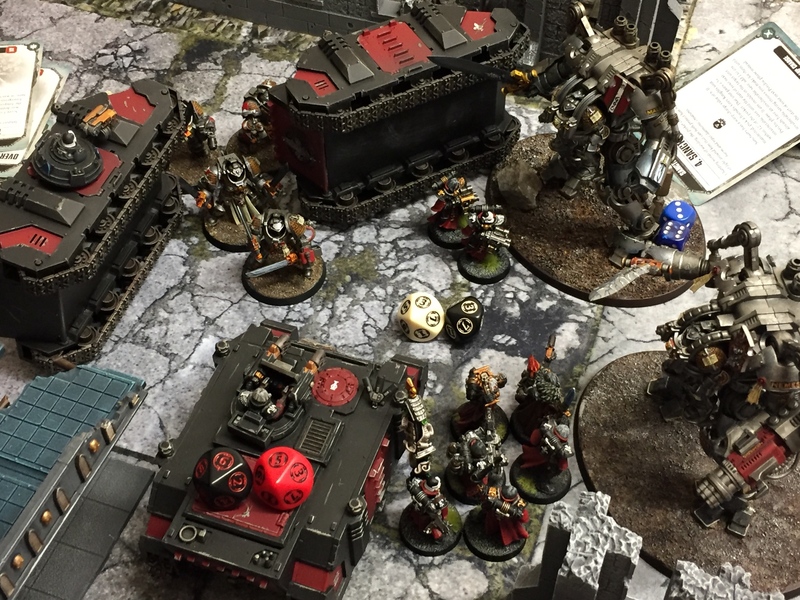 The joy of random objectives keeps things fresh and allows players to regain the initiative even when things appear to be stacked against them. Great fun… and we’re already planning the refight! That looks like an epic brawl of champions, brutal! And pretty shnazzy painting to boot. Thanks for posting. 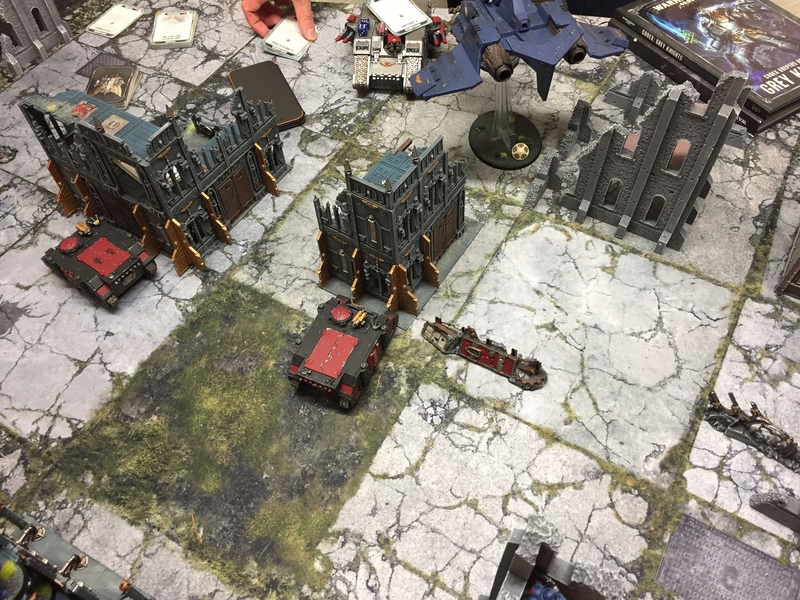 I’m not in anything Warhammer at all, but I always appreciate good AARs and terrain and miniatures deployment. Cheers Guys. It was a great game and we had a fantastic time playing it. It’s nice we’ve got to a stage where we can play with fully painted armies!